We lead increasingly visual lives these days. How can you tell if someone’s #bestlife is really theirs? If you see an image that looks too good to be true, keep in mind that it might be. It might have taken hours to achieve the perfect post with special lighting to achieve that natural glow and lots of planning behind that seemingly unplanned pic. Of course, it’s one thing to stage a photo or select a filter, and another to digitally alter an image in an effort to purposely confuse a viewer or gain attention. If you suspect an image is being used improperly or being recycled, one way to stay alert visually is to double check images using Reverse Image Search on Google. While working in the Chrome browser, right-click on an image and select “Search Google for image.” This is a good way to check if you believe a photo might not be current or was actually originally intended for something else. If regularly searching images (to find where an image came from or to handily track down a high-resolution version), TinEye is the official extension for Chrome. You can also reverse search images from your phone. To do a little digging on the image itself, check the metadata, which includes everything from the camera make and modle, to camera settings used, and the date and time an image was captured. You can check the metadata using various programs. Think back to a time a friend invited you to do something. You might have agreed immediately, or you might have felt a little hesitant. Why? In online marketing and communications, we’re always inviting our friends and followers and clients – to join us. Sometimes, we’re inviting them to subscribe to a newsletter. Other times, we’re inviting them to a member rewards program. Either way, we have to put thought into the invitation if we hope to get a positive RSVP. This is where your call to action, that word or phrase that prompts your audience to do something, comes into play. Some marketers may leave out the call to action, thinking clients already know what to do next. That’s not recommended. Others might fear a call to action will come off as gauche or inappropriate. It won’t. What would you do if a friend mentioned an upcoming party, but then offered no further details? How would you know they wanted you to join them? How would you know where to go or when? 1) Invite clearly. Include necessary information for your guests in the invitation: the date, the time, the place, the occasion, the host(s) and when and how to respond “yes” or “no.” Add any special information such as what to wear or what to bring, say, for a pot-luck. Like any good invitation, calls to action work best when they are direct, personal, and generate excitement for something more to come. Establishing a clear next step is a key part of continuing the conversation, and that step can be tweaked depending on the person and subject. Your call to action shouldn’t interrupt your message or alter your tone, but carry it home. Ask yourself these questions the next time you are trying to come up with a call to action: What do I want people to do? Why do I want them to do it? How do I want them to do it? Play with using supporting copy, like a question, and offer readers different paths to take. Use A/B testing to see how your viewers respond to buttons versus links in the text. Try one phrase and then come up with another way of saying the same thing. Think about what words will matter to your specific audience. How would you like to be invited? Is it possible to be lucky in marketing? Just your luck! Everything is going your way. Sometimes it can feel as if higher forces are behind notable events, like a risk paying off or a new client showing interest, and even plans falling apart. But relying on superstitions can simplify what’s actually happening. The concept of luck came about as a way to make sense of events and tell a story, says statistician Jeff Rosenthal, a professor at the University of Toronto and author of Knock on Wood: Luck, Chance and the Meaning of Everything. “It goes back to the old days. If there was a big storm, well, that meant the gods were angry. It didn’t just mean that the water molecules were moving in a certain way,” Rosenthal told The Current radio program in December. Rosenthal studies the workings of randomness and uncertainty, and in his, book says he is often asked if he believes in luck. He explains there are two ways to define luck. There is “random luck” (where events or people come together just right, like two people meeting at a party) and there is “forceful luck” (where special forces are responsible for bringing those people together). As a statistician, Rosenthal cautions against believing too strongly in the latter, because patterns are not set. Instead, Rosenthal suggests people keep in mind there are things we can control, and there are things we can’t. That mindset can prepare us for better—not necessarily lucky—outcomes. Sure, unfortunate events may impact our work. If we properly prepare, do our research and collect the right data, we’ll be able to weather the storm. Can we make ourselves more lucky? As with so many things in life, luck can come down to having the right attitude. That’s what psychologist and author, Richard Wiseman, has suggested could be the answer to more people being lucky. People who define themselves as lucky likely also define themselves as optimists. They stay positive and look for opportunities. Even with a set task, we don’t have to do the expect. Nothing is guaranteed, and that’s not bad! By staying creative and open-minded, we can make our own luck. How should we talk about luck? Outside of talking about lottery tickets or weather, when we say someone is “lucky,” we are often ignoring their hard work and talent. In marketing, it can sometimes seem as if everything is falling into place. Sure, there may be a magic, indefinable ingredient, but there’s also data, strategizing, brainstorming and planning. There is even a science behind making content go viral. It’s OK to be thankful when events inexplicably line up. But the next time your plan pays off for you or your client, don’t downplay your skills by attributing your success to luck. 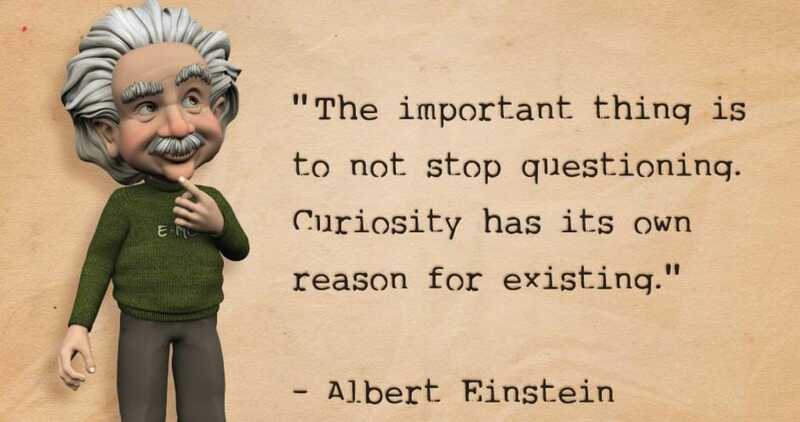 To keep experimenting, to stay curious and to connect with others—Einstein reminds us that hard work and information don’t necessarily add up to achieving our goals. Instead of doing what we’ve always done or accepting the status quo, we need to broaden our horizons and make fresh connections. How can you make your work more relevant? Find direction in these Einstein quotes. Ding! That’s the sound of another meeting request coming through. Is your calendar working as hard as you are to keep life running smoothly? Chances are a digital calendar keeps you mostly on track—you may even depend on one to schedule promotions and social media, as well as remind you when to go to the dentist. The ability to quickly create appointments and receive needed reminders is truly helpful, but you may be totally unaware of other digital calendar features that can push your productivity and make communications easier on your clients and coworkers. Thanks to PC Mag’s recent post 12 Google Calendar Tricks You’re Probably Not Using, we have a few new tricks for G Suite users. Here are four favorites. Did you accidentally double-book yourself for the big game? Do major and minor holidays sneak up on you? Google Calendar has several calendars of interest that you can browse and add, without having to plug in the date of every holiday yourself. You can even track the phases of the moon. You may already start the day with a glance at your inbox. Thanks to Google Calendar, you can opt in to receiving an email at 5 a.m. each morning with your daily agenda pulled from your existing calendar events. For the more details and tips, read the full article at pcmag.com. Email marketing can be some of the most effective and least expensive options, especially for a small business at holiday time. Check out the creative ideas for your holiday email marketing from our friends over at Constant Contact. So, get your list shined up, head over to Constant Contact, and get the email blasts ready! Need some help or want a full service solution? Contact us today. We can help you with anything from lists, templates, copy, imagery, custom coding, or a full service mailing. In a recent Marketo article, they presented five extremely successful content marketing case studies including the tactics used, results measured, and why it matters to marketers. Increasing Blog Referral Traffic by 58% with Onsite Marketing: In this case study iSpionage describes how they managed to increase traffic by 58.09% in just one month by using an exit intent popup. Infographic Creates Over 11K Additional Website Visits in 2 Weeks: SEOTravel created a very clever piece of content that was extremely shareable and caused an increase 11K+ website visits in as little as two weeks. Quick Wins from Content Built with Publicly Available Data: In this content marketing case study, YesOptimist helped a startup, CollegeRaptor, to get from absolutely no organic traffic to 100K visitors per month in just one year. Find the Right Content Topics for Less Exciting Industries: LawnStarter created content their audience cares about, even though it did not entirely focused on their product or service. Scale Marketing with Content Loved by Search Engines: Fieldwire boosted the most high-potential pages with data-driven optimizations such as what keywords were they ranking for in order to gain higher conversion rates. Read the original article at marketo.com.